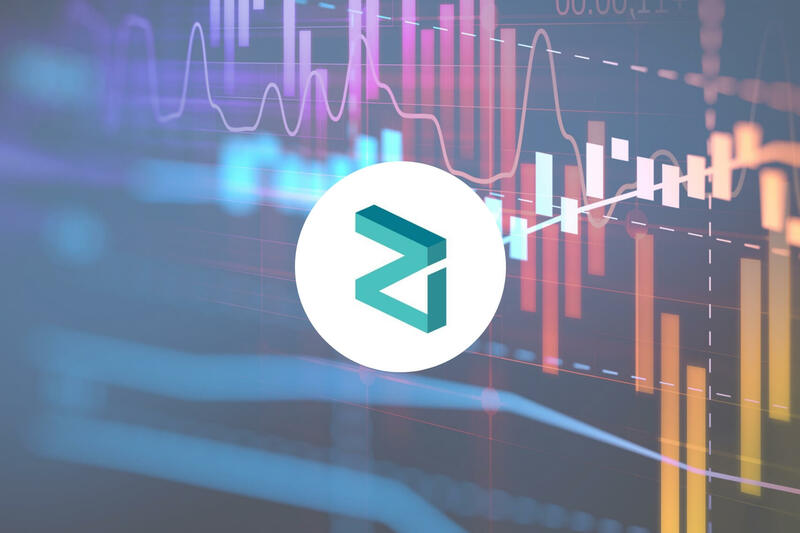 Zilliqa Price Analysis: ZIL Trades Within 3-Month Trading Range -- Can the Bulls Gear Up to Break Above $0.05? ZIL/USD has been trading within a wide range between $0.026 and $0.048 for over 3 months now. Movement to the upside is limited until ZIL/USD breaks above $0.050. Support moving forward: $0.036, $0.032, $0.028, $0.026, $0.022. 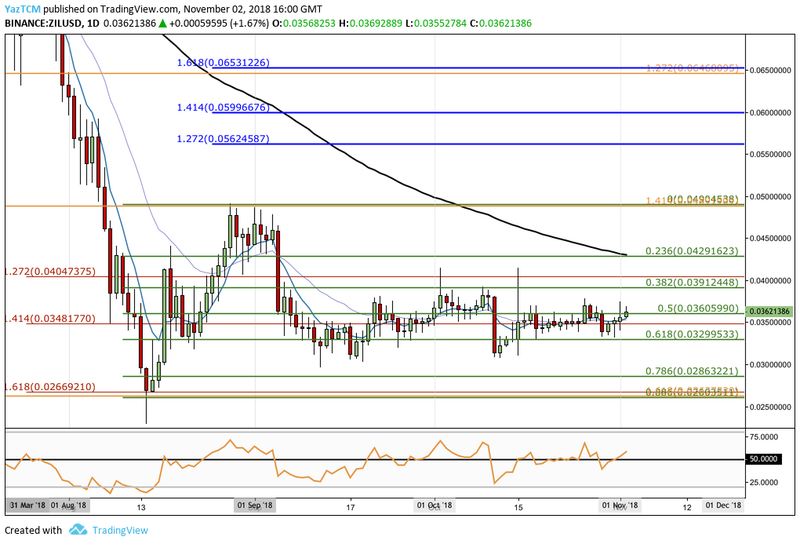 Zilliqa has seen a 4.80% price raise over the previous 24-hour period as the cryptocurrency presently trades at $0.03621, at the time of writing. The coin has been relatively stable over the last 7 trading days, only dropping a small 0.5%. Zilliqa is ranked 30th in terms of overall market cap, with a total market cap value of around $282 million. The relatively young 9-month old coin has seen a rough 90-day trading periodm seeing a substantial loss of up to 40%. The market is now trading at a value that is 82% lower than the all-time high price. 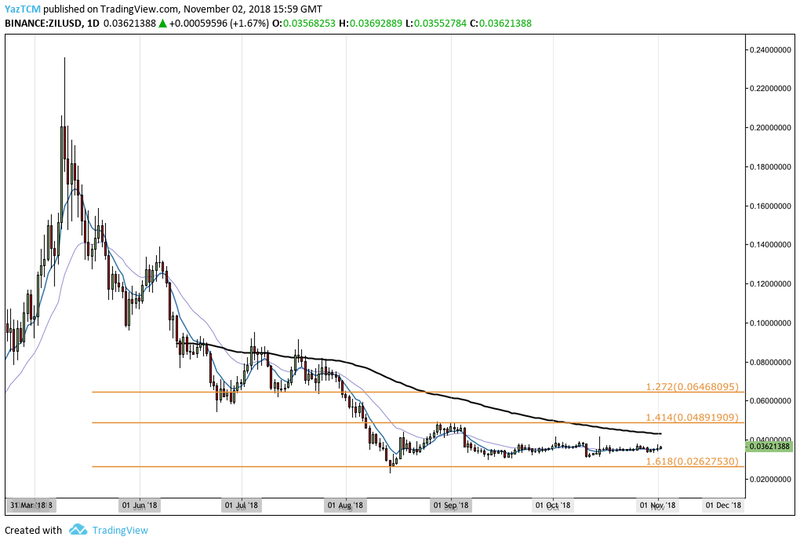 Let us continue to analyze the ZIL/USD market over the long term. Looking at the chart above, we can see that the ZIL/USD market has persistently been declining since placing the all-time high price of $0.2255 on May 10, 2018. The market downtrend came to a halt during August 2018 when price action reached a support level marked by a downside 1.618 Fibonacci Extension level priced at $0.02627. As ZIL/USD reached the area of identified support, the buyers stepped in to stop price action from heading further lower. The market rallied from this area of support to find higher resistance at the downside 1.414 Fibonacci Extension level priced at $0.04891. We can see that ZIL/USD has been trapped within a range between the highlighted support level at $0.02627 and the highlighted resistance level at $0.04891 for the past 3 months. Let us continue to assess price action a little closer and highlight any potential areas of support and resistance. Analyzing ZIL/USD from a closer time horizon, we can see that the support at $0.026 was further strengthened by a shorter-term red downside 1.618 FIbonacci Extension level (drawn in red) priced within the same area. Price action rose up from this area of combined support and went on to create a remarkable 112% price increase. ZIL/USD began at a low of $0.02290 on August 14, 2018 and extended to a high of $0.04917 on August 28, 2018. ZIL/USD has since rolled over to find support at the short-term .618 FIbonacci Retracement level (drawn in green) priced at $0.03299. The market is now trading slightly above support marked by the short-term .5 Fibonacci Retracement level (drawn in green) priced at $0.036. If the bulls can continue to climb higher away from this support level, they will encounter immediate resistance above at the short-term .382 Fibonacci Retracement level (drawn in green) priced at $0.03912. If the bulls continue even further higherm then more significant resistance will be located at the .236 Fibonacci Retracement level (drawn in green) priced at $0.04291. This resistance is bolstered by the 100-day moving average level which is currently hovering directly at the same price level. If the buyers can proceed to break above the 100-day moving average and eventually climb over resistance at the $0.050 handle, further higher resistance can then be located at the short-term 1.414 and 1.618 Fibonacci Extension levels (drawn in blue), priced at $0.05996 and $0.06531 respectively. Alternatively, in our bearish scenario, if the sellers push ZIL/USD below $0.036, they will be met with further support below at the short-term .618 and .786 Fibonacci Retracement levels (drawn in green), priced at $0.03299 and $0.02863 respectively. If the sellers continue to push price action even further lower, more support can be expected at the .886 Fibonacci Retracement level priced at $0.02603, followed by the August 2018 low priced at $0.02290. The RSI has recently swung into the favor of the bulls as it breaks above the 50 handle. This could indicate that the buyers are preparing to push the market back toward the $0.050 handle. Let us continue to analyze price action for Zilliqa relative to Bitcoin over the long term. From the long term perspective above, we can see a similar scenario in which Zilliqa has been persistently dropping against Bitcoin until support was reached at a downside 1.414 Fibonacci Extension level priced at 425 SATS. This area of support proved to be strong enough to cause a market rebound causing the market to trade sideways instead of in a downtrend. Let us continue to analyze ZIL/BTC a little closer and highlight any areas of potential support and resistance. Observing the market from a closer time horizon, we can see the bullish price surge starting at a low of 391 SATS on August 14, 2018 and rising to a high of 689 SATS on August 28m 2018. This was a price increase totaling 75% from low to high. We can see that the market has since retraced to find support at the .618 Fibonacci Retracement level (drawn in green) priced at 505 SATS. This price level provided strong support for the market during both September and October 2018. ZIL/BTC is now trading at resistance provided by the short-term .382 FIbonacci Retracement level priced at 575 SATS. If the bulls can continue to climb above this resistance level, they will encounter higher resistance at the long-term .886 Fibonacci Retracement level (drawn in black) priced at 633 SATS. It is important to highlight that this area of resistance is further bolstered by the 100-day moving average which is trading in the same area. If the buyers can continue to break above the 100-day moving average and above the August 2018 high at 689 SATS, then we can expect further higher resistance at the 1.272 and 1.618 Fibonacci Extension levels (drawn in blue), priced at 733 SATS and 877 SATS respectively. On the other hand, in our bearish outlook if the bears pressure the market lower, we can expect immediate support lower at the short-term .5 and .618 Fibonacci Retracement levels, priced at 540 SATS and 505 SATS respectively. 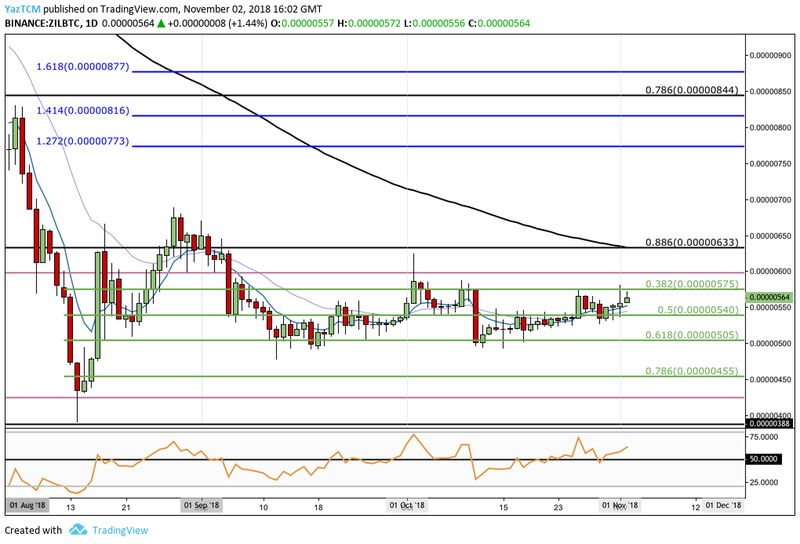 Further support located below this can be expected at the .786 Fibonacci Retracement level priced at 455 SATS, followed by the August 2018 low at 391 SATS. The RSI is also showing that the bulls are in control of the market momentum for ZIL/BTC. So long as RSI remains above 50, we can expect the market to make some gains.